When you bring a new kitten into your home, your existing cats need to accept to its presence. While adult cats will adjust to the company of a new kitten in their home more readily than another adult cat, the total period of introduction can take as long as two to three months, according to the Champaign County (Illinois) Humane Society. Start your new kitten's relationship with your other cats out on a positive note with a slow and careful introduction, to reduce stress on both you and your pets. Create a "safe" space for the new kitten separate from the rest of your home in a spare room, walk-in closet or bathroom. Give the kitten its own food and water dishes, a litter box, cat bed and toys. Bring the kitten home directly to this room, without allowing your other cats access to this space. Allow the kitten to adjust to its new home and space for three to four days. Let the kitten out of its room to explore the rest of the house and confine the other cats to the kitten's safe room for a half hour, then switch them back. This allows each cat to get used to the other's scent, the PAWS Companions website states. Place treats at the entrance to the kitten's room and under the door. 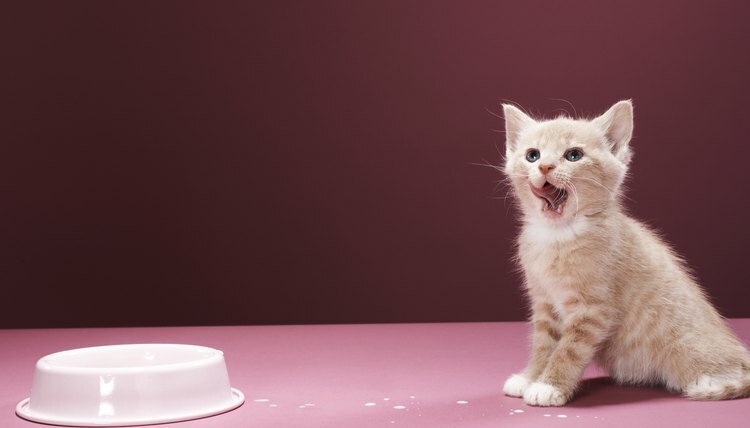 These treats will tempt the kitten to try and get them and attract your other cats to the room, making the presence of the new kitten a positive one, the My Healthy Cat offers. Feed the cats and kitten at the same time, on each side of the door to the kitten's room. Reward your cat for indifference or curiosity about the kitten with treats; ignore hisses and growls. Prop the door open with a door stop enough so that the cats and kitten can see and smell each other, but not come in full contact. If, over a period of a few days, the cats do not act aggressively toward the kitten, prop the door open enough to them slip their paws through the door to play. Spray a synthetic cat pheromone around your house to create a soothing, safe atmosphere. Allow the kitten out of its room. Supervise interaction between the cats and kitten without forcing them together. Play with the new kitten daily using interactive toys that your existing cats can also come over and play with. This encourages positive interaction with the kitten. Provide a separate litter box for the kitten, allowing all of your cats to have their own litter box plus one extra, the Doctors Foster and Smith website suggests. Before bringing home a new kitten into a multiple cat household, always make sure to have the kitten given a health inspection and vaccinations by a veterinarian.